Call Ken Jansen at (913) 908-2215 when you’re ready to buy or sell a home in Woodland Creek. 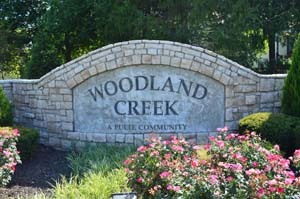 Woodland Creek is a community in Olathe, KS, convenient to Kansas City, KS or Kansas City, MO. To reach Woodland Creek, take I-35 to 119th Street Exit, East on 119th Street to Blackbob/Lackman, South on Blackbob/Lackman. Woodland Creek is located between 155th and 159th Streets just West of Blackbob or Lackman Road in Southern Johnson County. Woodland Creek is in the award-winning Olathe School District. Most homes in Woodland Creek have 3 or 4 bedrooms, with an occasional 5th, 2.0 to 3.5 or more bathrooms, and all of the homes have at least a 2 car garage, with a 3rd car garage popping up every so often. A good number of the garages in Woodland Creek have a 6' extension on the garage bay which gives extra storage space for 'stuff', so you might end up with a garage that could accommodate a boat, small RV, or an extended truck or van. In some of the floorplans the 6' garage extension also extended the master closet, particulary in the Derby Plan (2564 plan), Fallbrook Plan (2382 plan) or the Carlyle (2195 plan). An average homesite or lot size will be in the 1/5 to 1/4 acre range, with some smaller and some larger. Woodland Creek Meadows and Woodland Creek Estates are loaded with cul-de-sac homesites and parkside settings. The homes range in size from just under 1,400 feet to over 3,500 finished square feet. Typical selling prices are in the $200,000s. Woodland Creek is handy to shopping, restaurants, and your choice of two Starbucks locations. Across the street you’ll find Heritage Park, the second largest park in Johnson County. With a 30 acre “bark park” (off leash dog park), golf, soccer, picnic pavilions, and trails for hiking and biking, Heritage Park provides Woodland Creek residents with amenities you’d expect in a pricier community. Woodland Creek Estates with homes from 1600 to 3500 square feet. Both sections are in Olathe, KS, the county seat of Johnson County. Olathe has been named to several national “Best Place to Live” lists. Nearby shopping and restaurants. Mmmm...Minsky's Pizza.